On the job: Trish Farry (right) teaches an anaesthesia technician how to perform a local block for dental procedures. At a swanky conference dinner in Adelaide earlier this year, a cheerful salt-of-the-earth Queenslander called Trish Farry was all smiles. Not only was the atmosphere convivial and the company engaging, but just a few days earlier she had been officially honoured as the Veterinary Nurses Council of Australia’s (VNCA) Veterinary Nurse of the Year for 2017. And it’s easy to see why. 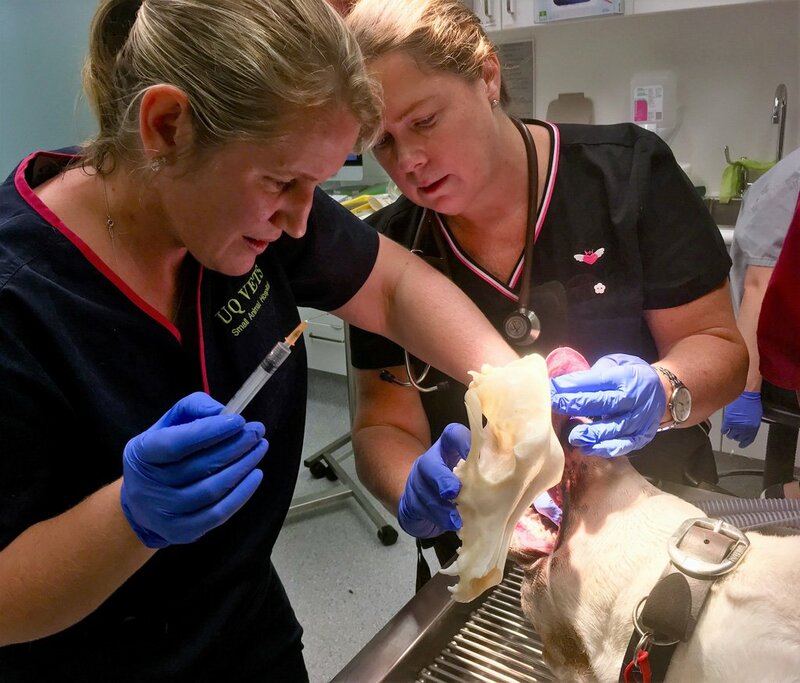 Farry is a clinical instructor in anaesthesia within the School of Veterinary Science at the University of Queensland (UQ). She has over 30 years’ experience of vet nursing, including a decade as director of vet nursing at UQ, has board-certified specialist veterinary technician qualifications in emergency and critical care and anaesthesia from the US, she’s served on the Board of Regents for the International Veterinary Academy of Pain Management, and she’s a past president of the Academy of Veterinary Emergency and Critical Care Technicians (AVECCT). Farry adds that actively contributing to and getting involved in the profession through different organisations and volunteering are great ways for vet nurses to expand their knowledge and skill set. She gives the example of being nominated and elected as president of the AVECCT, which has not only been “a real career highlight” so far but also opened even more doors for her. Farry is also a firm believer in the power of mentors. She says vet nurses need people who will support them, be there for them, sometimes push them out of their comfort zone, and catch them if they fall. She names Dr Terry King, a veterinary pioneer in emergency and critical care in Australia, as one of her own mentors, along with Drs Helen Keates and Brenda Dixon, two anaesthetists from UQ, whom she says “made anaesthesia look really cool. They really inspired me and guided me and supported me. I think they instilled a great passion in me but also a healthy respect for anaesthesia. I saw what they did and thought, ‘I want to be part of that as well’. Just up the hallway from Farry at UQ is Dr Margie McEwen, a senior lecturer and section head of veterinary anaesthesia and analgesia. She is also Farry’s supervisor. Dr McEwen believes that finding the right vet nurse comes down to a combination of their education and their skill set but says her main question is, are they going to fit in the team? “I can educate people and give them opportunities, expose them to the skills and help them to learn but if they’re not prepared to fit into the specific team, then the skills alone are not usually enough. When asked how important annual pay rises are to ensure staff longevity, Dr McEwen says, “We all know it’s not just the pay packet. If the pay packet comes in with no thanks, people don’t feel valued. We have to demonstrate appreciation. My philosophy is that everyone in the team has a voice and the right to express themselves. When they have something going on, and when they have a question or an issue, they are given a voice. When you feel heard, you feel appreciated. “The other thing I’m very mindful of is to comment on a job well done—to appreciate long hours and to thank people when they’ve gone the extra mile. It means so much to say to somebody, ‘You look really tired, you worked so hard today and you did great work and I really appreciate that’. Bringing it back to the human condition and articulating value is so important and so often missing. “One of the things I see in life is that there’s a lot of judgement and criticism, and mostly people don’t mean to do the wrong thing. If you create a safe space for people to learn, they will thrive,” says Dr McEwen. Back in Adelaide, there’s another bright dedicated vet nurse called Jo Hatcher who has just completed her term as president of the VNCA. Hatcher works for Gawler Animal Hospital and has been vet nursing for 17 years. She also works as a trainer and assessor for vet nursing students with the Animal Industries Resource Centre. When asked what vet nurses need to really excel at work, Hatcher says, “It’s the support that you have around you that makes the difference. “In some practices, there are nurses who have done so much training but they’re not actually being utilised to their full potential, so that’s a big thing too,” she says. Dr Dave MacPhail is Hatcher’s boss and the practice principal at Gawler Animal Hospital. He is also the owner of Vision Veterinary Business Consulting with an MBA and DVM in veterinary medicine. “When we’re hiring staff, and this applies across the board—whether it’s a vet, a vet nurse or a receptionist—we’re looking for someone with the right attitude, and the right aptitude so you can teach them things,” he says. “It’s no good having a nurse come in who knows lots of stuff but has the wrong attitude because they just don’t fit with our team. So, a lot of it is about teamwork, and then it’s training them, training them and more training them. “We do a lot of in-house training so we introduce the younger nurses to the most experienced ones, and then they help them through. We also give the younger ones a bit of responsibility and encourage them to try things. And if things go wrong, there’s somebody there to help them. “Singling them out if they have done something well is important too,” continues Dr MacPhail. “The experience of ‘doing’ is a fantastic teacher. We work on people’s strengths so they can flourish. How do you turn an average vet nurse into a brilliant one? Veterinary leaders reveal their secrets.